It's never too early to start teaching kids where their food comes from. That's the thought process behind a number of programs around the country that allow students to grow and harvest their own produce. But a new concept, from Italian designers Gabriele Capobianco, Edoardo Capuzzo Dolcetta, Jonathan Lazar, and Davide Troiani envisions an entire preschool built around sustainable farming, Inhabitat reports. The proposal, titled "Nursery Fields Forever," was recently awarded first prize at this year's AWR International Ideas Competition. Instead of classrooms, the school would feature open spaces where vegetables could be cultivated and animals could roam freely. 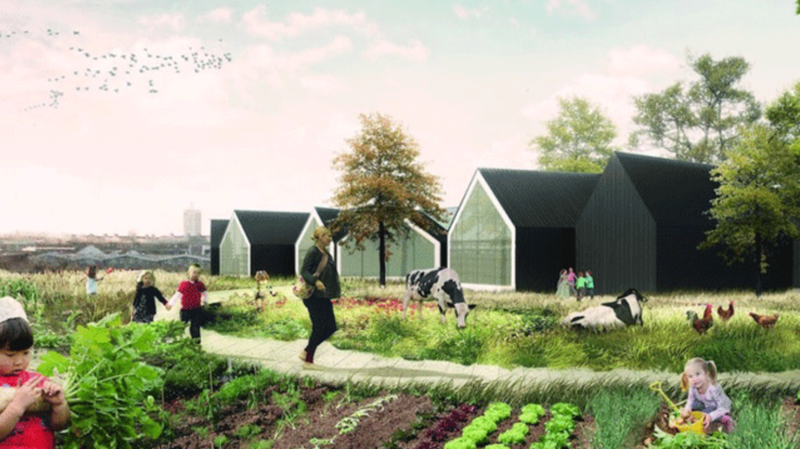 The buildings would be surrounded by livestock pens and garden plots, where children could learn about food and nature by interacting with it first-hand. In addition to practicing sustainable farming, preschoolers would also be introduced to the concept of renewable energy through wind turbines and solar panels located on the school grounds. "We tried to make a different way to learn," lead designer Edoardo Capuzzo Dolcetta told Fast Company. "So not reading a book, or listening to a teacher, but experience directly based on practice." After winning the AWR contest, the team is now hoping to turn their idea into a reality. They're currently in talks with a Rome-based child psychologist who's looking to build something similar to "Nursery Fields Forever." You can check out the art from their winning concept below. Images courtesy of AWR Competitions.